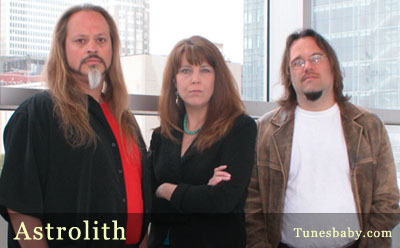 Rock, Blues, Jazz and Classical influences bleed together to create Astrolith’s musical sound signature. Rich piano sounds blended with energetic guitar licks and distinct rhythms, overlaid with female vocals, complimentary harmonies and powerful lyrics combined for a rocking, melodic pallet of music. Scott, Cayla and Ragon have put together 20 original songs with several more under construction. Scott’s the producer and arranger of their musical ideas. Combined with his intellectual lyrics, he transforms them into complete orchestrated works of art. Influenced by many great drummers (Phil Collins, Neil Peart, Terry Bozzio, Peter Criss, Bill Ward and Myron Grombacher) he developed a technical Hard Rock style that integrates primal rhythms. Cayla’s soulful voice conveys the deep emotions that Scott writes about. Years of performing a variety of genres helped her develop her own voice, one that is powerful and passionate. Ragon’s fearless attack creates positive energy and inspires improvisation. He surprises us with the unexpected; however his confident guitar rhythms give the songs momentum and drive.